And this is no surprise, as there actually is no such thing as ‘cellulite’… So how do we get rid of something which doesn’t exist? The beauty spas then started cashing-in and profiting big-time by marketing “beauty” services and products to get rid of “cellulite”. And if you’re like most women who’ve been challenged by this issue, then you probably already know those passive and superficial beauty treatments do not get rid of the dented shadows and mushy dimples on your buns, legs, hips and thighs. Key #1: You cannot get rid of the mushy dimples and flabby shadows (cellulite) by rubbing a “toning” lotion, a goopy gel or expensive skin cream on your trouble zones and problem spots. So: STOP wasting all that money on them. Despite the fact that there are dozens of supposed ‘cellulite reduction’ products on the market, there is no possible way for any one of them, no matter how expensive, to get rid of your cellulite. Cellulite is not a skin problem. It’s an underlying structural issue, that can only be targeted by reversing the cause of atrophied muscle fibers directly beneath our “cellulite” trouble spots. Since the mushy dimples and saggy shadows are a superficial symptom of a problem below the surface; it’s impossible for the creams, lotions or gels to have any physiological impact on the issue. Key #2: Risky and expensive ‘medi-spa treatments’ can only reduce our funds, not our cellulite problems. 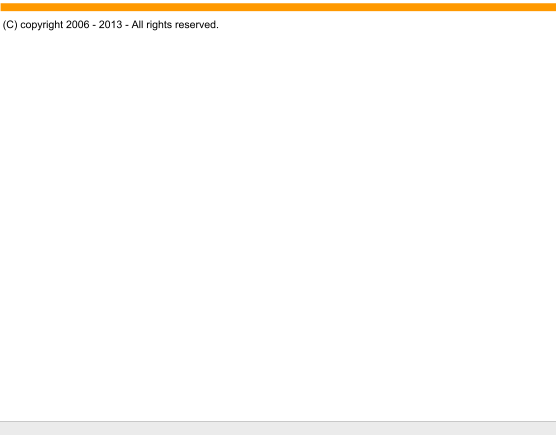 And there are many consumer reports about women being seriously scarred or injured as well. So, avoid these no matter how much they are hyped-up, or pushed on you. We’ve met 3 former “beauty-spa” technicians over the last 7 years who were bold enough to tell us about how they were trained to lie to the women customers about “cellulite” and how to string them on for months and months of expensive treatments (promising the results will “eventually come”), fully knowing that what they are doing CANNOT get rid of “cellulite”, and also endanger their unsuspecting customers. Painful, dangerous and uncomfortable services ranging from endermologie to body-wrapping have been proven to be totally ineffective when it comes to treating cellulite. However, advertising and marketing loopholes allow these services to be cleverly pitched to desperate women who are at wit’s end with the unattractive dimples and shadows on the lower-body problem areas. Yes – it is common to see a mother and daughter, both with the lower-body “orange peel” look, BUT this doesn’t mean cellulite is genetic – it simply means both women have not yet found a way to lift, tone and firm the muscle layers under the dimpled, saggy skin. 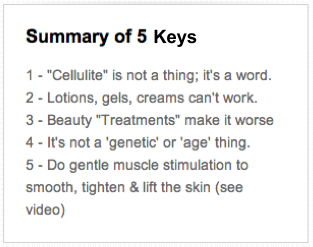 Key #4: You can reduce & fix “cellulite”, regardless of your age – or when you began to notice it. So, don’t let anyone else tell you otherwise. 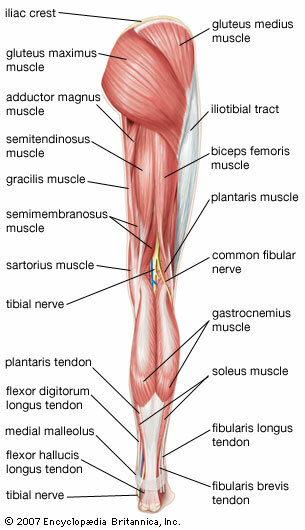 Since “cellulite” is a structural issue (flat, atrophied muscles) – it can be targeted with simple and unique body-movements which focus on the mushy and saggy areas, by reversing the muscle atrophy. These types of gentle moves can be followed by most women, regardless of her age or fitness level. And it doesn’t matter if the “cellulite” started in the early teen years – or after pregnancy – or after menopause – it’s still a structural issue that results from soft, un-toned muscles underneath the saggy, dimpled, shadowy skin. Key #5: We target the dimples and shadows of “cellulite” through a series of simple, yet specifically targeted lower-body movements. You place PROPER focus on your legs, buns, hips and thighs. These unique movements focus on lifting, shaping and toning the muscle layers so they gently push outward against the skin, burning off any excess flab as fuel – to bring back the smoother, tighter, sculpted and more attractive appearance. 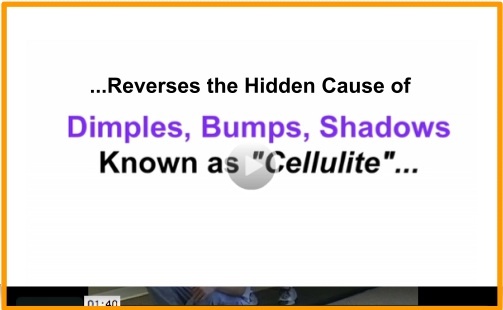 =>> This is how regular women can reverse the cause of saggy cellulite dimples and mushy shadows… AND, if there happens to be any excess flab in those zones – it may be burned off as fuel by the muscles. This bonus of losing any unhealthy excess body-fat is nice because it reveals a great body and it works wonders for your health profile. The movements mentioned in the video are moves you can start doing today, right in the privacy of your own home. And if you start this type of targeted muscle stimulation method this evening, or in the morning – you could start feeling changes within 1-2 weeks and may begin to see enhancements within 2 to 4 weeks. NOTE: The Dimples, Ripples and Shadows of “Cellulite” Can Get Worse and Worse if They Are Not Addressed Properly. And the worse it gets, the harder it is to reverse. It’s your body so just do the right thing for it.